Tauntaun Hoodie Keeps You Warm - Guts Included - Are You Screening? There are some things that actually pull of an undeniable cool factor, and a really strong, accidental argument comes around when you really don’t want something, would never use it, and still find yourself happy that it’s out there. In the cast of the Tauntaun hoodie, I’m a little torn. Part of me really loves that this exists, but I’m not sure how happy the other part of me is about that. Still, how do you not love just about anything Tauntaun related? 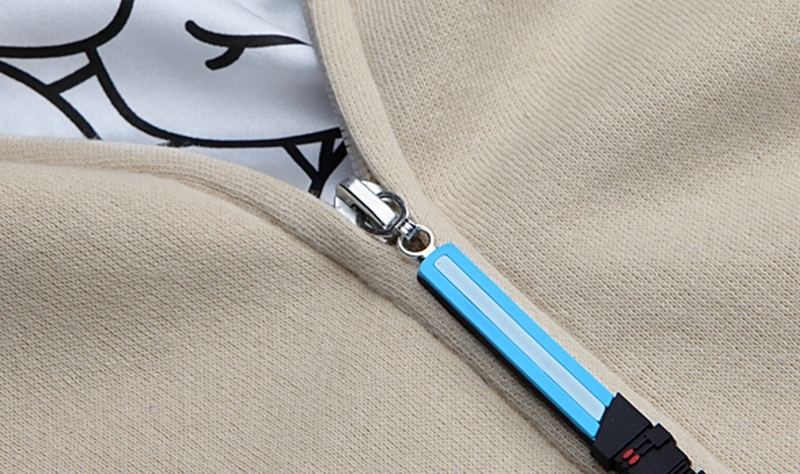 The lightsaber zipper reveals the guts inside. I mean, come on. I’m not sure I can figure out wearing the thing, but apparently there are daring people out there. Considering that I’ve seen several sites refer to these as now being “a thing,” they must be selling pretty well. What’s your take? Awesome or nutty? Tauntaun Costume HoodieYou never know when you’re going to be unexpectedly stranded out in the cold. That’s why it’s best to bring your trusty Tauntaun along. They’re a source of both transportation and warmth. (Although after the warmth part, there’s not so much transportation capability leftover.) The problem is, most places won’t let you bring in a Tauntaun. We know. We tried. We even attempted to tell them it was our “seeing-eye Tauntaun.” No dice. For some reason this Tauntaun Costume Hoodie goes over better. (Maybe it’s the smell?) When you’re cold, just unzip your cream and grey, 60% cotton / 40% polyester Tauntaun pal and climb inside. The Tauntaun’s face is printed on the hood, which comes complete with dimensional Tauntaun horns and ears. The 100% polyester satin lining looks like white Tauntaun intestines. (Who knew they were so smooth and silky?) Raglan-style sleeves and contrasting kangaroo pockets, plus a blue vinyl lightsaber zipper pull finish off this cutie. Machine wash cold. Tumble dry low. Imported. Sizing chart S M L XL 2X 3X Chest 39 in. 41 in. 43 in. 45 in. 47 in. 48 in. Length 27 in. 28 in. 28 in. 29 in. 29 in. 29 in.